To make the dough, combine 1 1/2 cups of the flour with the sugar and the salt in a food processor. Pulse a few times to incorporate. Sprinkle the butter pieces on top of the mixture and pulse until the dough begins to clump (about 30 quick pulses). Use a spatula to pat the dough down and sprinkle the remaining 1 cup of flour on top. Pulse until the dough is just combined and transfer to a bowl. Add the water and use the spatula to fold the dough together until it comes together into a nice ball. Divide dough in two and press into disks. Wrap in plastic and refrigerate for two hours or until ready to use. When the dough is nearly done chilling, preheat the oven to 500 degrees. Peel & core the apples and slice them thinly. Add the lemon juice & zest and mix to keep the apples from browning. In a small bowl, combine the dry ingredients and pour over the apples. Mix well. Pour the brandy over the mix and stir to combine. Roll the dough out on a well floured surface and press into a pie pan. 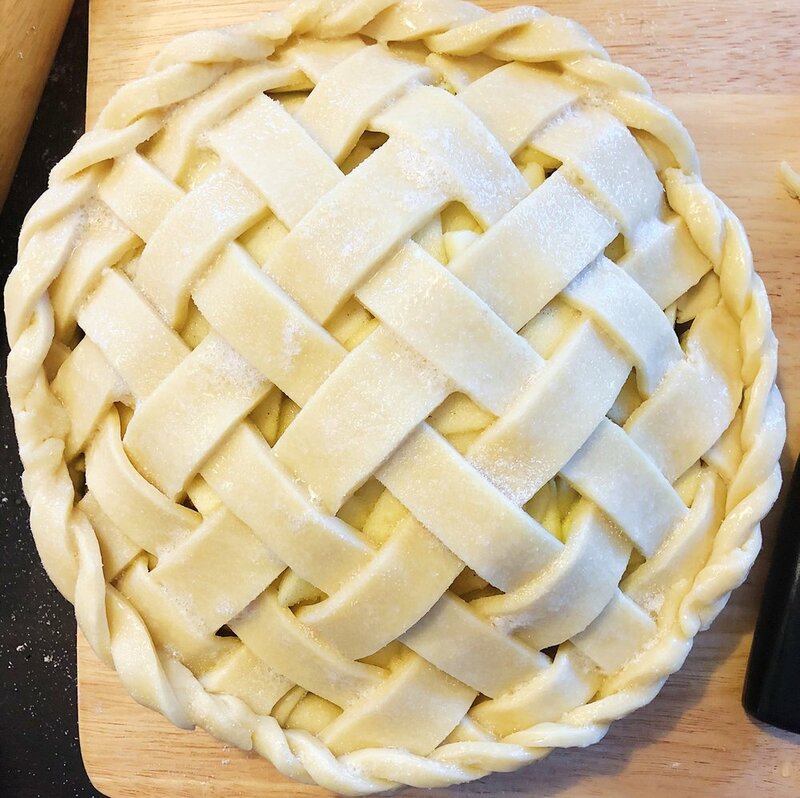 To make a lattice top, roll the second disk of dough out into a 12" circle. Use a knife or pizza cutter to slice even strips (mine were about 1/2" each). Arrange the strips into the lattice design (for a great how-to on this, click here). Brush the top of the pie with the egg wash and sprinkle with a bit of sugar. Place the pie on a baking sheet and slide into the oven. Immediately turn the temperature down to 425 degrees and bake for about 20 - 25 minutes until the crust is golden brown. Turn the pie and reduce the temperature to 375 and bake for another 30 - 35 minutes until the juices inside are bubbling. If the top begins to burn while baking, lightly cover with tin foil. Remove from the oven and allow to cool fully before serving.